A 57 year-old man presents to the emergency department after being accidentally poked in his left eye by his grandson. He complains of sharp pain on the surface of his eye and photophobia. He refuses to open his eyelids until you instill a few drops of topical anesthesia. Corneal abrasion — there is an epithelial defect that takes up fluorescein. Corneal abrasion (+/- foreign body) is the most common form of eye trauma presenting to the emergency department. Q2. What are the important features on history and examination? History of trauma: scratching or hitting the eye, nature of the object, could a foreign body still be present? 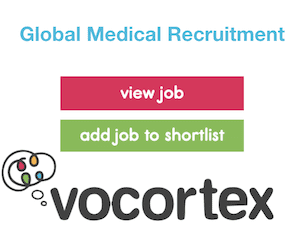 Symptoms: sharp pain, photophobia, foreign body sensation, tearing, discomfort with blinking. 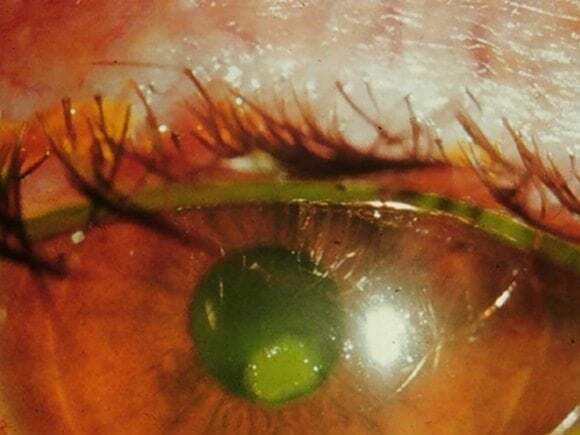 Use topical anesthesia and identify an epithelial defect that stains with fluorescein.Assess size, depth, and location.Other features – conjunctival injection, edematous eyelid, mild AC reaction. Evert the eyelids to look for a foreign body! Q3. What are the important differentials? Q4. What is the management? contact lens wearers need anti-pseudomonal coverage (among other nasty bugs) and are best discussed with an ophthalmologist. consider removal of loose or hanging epithelium that may impair healing. Q5. What is the follow up? Review until healed. A small, peripheral lesion can be reviewed after about 3 days. A large or central lesion is best reviewed the next day. Q6. What if the patient wears contact lenses? Contact lens wearers should be reviewed daily. Contact lenses should not be used until the defect is healed and the eye has felt back to normal for at least a week. Q7. Why is it important to evert the eyelid during examination of the eye? To rule out the presence of an occult foreign body hidden under the upper eyelid. If missed ongoing trauma to the surface of the eye may occur. Q8. How can the upper eyelid be everted? Folding the upper eyelid on itself, using the tip of a cotton bud or similar device to help flex the lid ten hold it in place. This takes a surprising amount of skill and can make the novice look like, well, a novice. ask the patient to look down. place the cotton bud about 5 mm from the lid crease and apply light pressure. 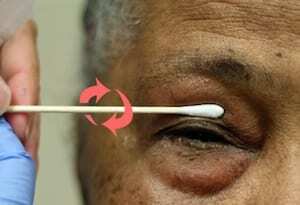 evert the over the cotton bud using the eyelashes to lift the eyelid up and away from the globe. Double-eversion using an eyelid retractor. If the upper eyelid is thoroughly anesthetised with topical anesthetic, the everted eyelid can be further everted using a modified paper clip (e.g. bed in half at 90 degrees and slide under the everted eyelid). Furthermore, flakes of metal from the paper clip can result in corneal abrasions. An ingenious method I learned from Michelle Lin’s ‘Tricks of the Trade’ on Academic Life in Emergency Medicine is to use a cotton bud to roll the upper eyelid back on itself — too easy!